By evening, Alabama surfaced for a rare Southern California appearance. One of the most successful and lauded bands in country music history, they went on a farewell tour early last decade but reunited a few years later for sporadic benefit shows down south. More recently, Alabama put out a pair of inspirational albums and guested on tracks by Friday’s headliner Jason Aldean and Sunday’s closer Brad Paisley. 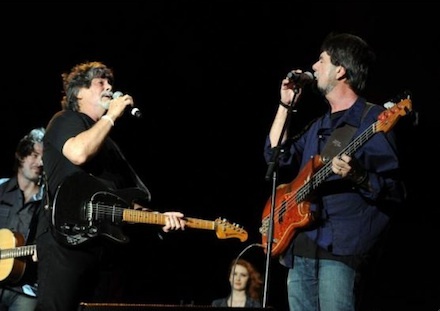 In Indio, the core trio of singer/guitarist Randy Owen, guitarist/fiddler Jeff Cook and bassist Teddy Gentry were joined by five auxiliary musicians. Together they made a full-bodied sound and still managed to reach the classic harmonies of yore, although at times their sound came across wavering and muted, hampered by persistent winds. During the ’70s and ’80s, Alabama scored dozens of No.1 country singles and a handful of pop chart crossovers. For those who grew up in those decades, the music is probably ingrained in their minds, whether they realize it or not. But the crowd in my vicinity were more concerned with chatting than actually listening to the music – another difference from Coachella. Before “Song of the South,” Owen related an anecdote about old family squabbles over the best vehicles; when he mentioned Chevy pickups, there were loud cheers. Then, before “High Cotton,” the singer pointed out how he once picked that material, and was indeed wearing it. Longtime enthusiasts were treated to one rousing hit after another: “Love in the First Degree,” the warmly romantic “Feels So Right,” mildly rocking “She & I,” “The Closer You Get.” Owen had no problem on the sustained vocal note in the Allman Brothers-esque “My Home’s in Alabama.” Finally they closed with the stomping hoedown of “Mountain Music,” where the steadily increasing tempo and Cook’s fine fiddle work were handled with ease. Headliner Aldean turned in a consistently rocking country set that found more favor with younger members in the audience. Booming drums and blaring guitars were at the crux of “Johnny Cash,” and the first major singalong came with “Big Green Tractor.” A glitch in clear projections on the big screens, however, made things difficult for those watching from afar. “My favorite band in the world just played,” said Aldean, referencing Alabama. Read the full article at soundcheck.ocregister.com!